Ku'uipo Paulo posted a comment on this site to indicate that Haleiwa Poi now produces a poi "powder" which she says reconstitutes well. She describes the powder as very fine, which leads me to think that it's freeze-dried poi rather than dehydrated poi. If freeze-dried, it will make a superior product when reconstituted with water. Ku'uipo kindly provided these photographs of a bag. She writes, "The instructions are 3 oz. of powder to 1 1/3 cup of water. Heat in the microwave and it's done. I usually cover the poi with water and put it in the refrigerator until I'm ready to eat it. I pour out almost all of the water, leaving a little to stir in. Not too much or the poi will be watery. There is no other mixing involved. It reconstitutes ready to eat." Ku'uipo kindly provided these photographs. 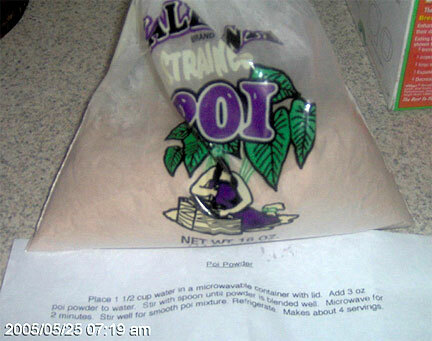 The one pound bag of Haleiwa poi "powder" cost $16.00 plus tax in Honolulu. Their address is P.O. Box 2157, Aiea, Hawaii 96701. 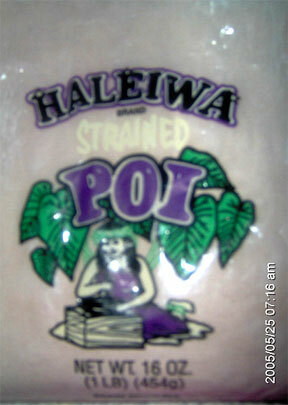 I can't find anyone on the internet who ships the Haleiwa Poi powder to the mainland, or internationally. If anyone is aware of someone who can ship this product, can they please post a comment here for the benefit of others? What's There to Know About Poi? Where Can I Buy Poi?